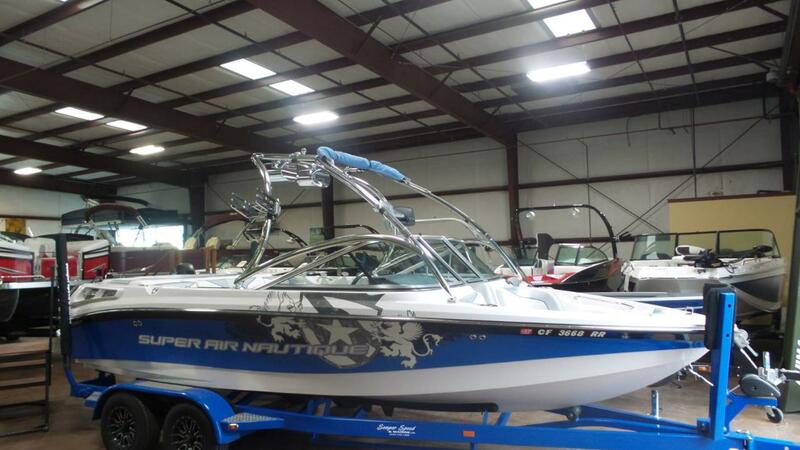 2008 Nautique Super Air 210 2008 NAUTIQUE SUPER AIR 210 with PCM EX343 5.7L engine onlu 149.4 hours This boat is super clean and ready for a new home. Reversible Stern Seating ~ Reversible Cockpit Seating ~ Bimini top ~ Launch Control System ~ SS Steel Tower with Board Racks ~ Tower Speakers ~ AMP ~ Bow Filler Cushion ~ Fiberglass Swim Platform ~ Hydo Gate ~ Ski Mirror ~ Cruise Control ~ Tandem Axle Trailer with Swing Away Tongue SEMPER SPEED AND MARINE 559-436-1888 or toll free 1-866-865-7619 2 words...SUPER AIR You like long ropes and faster speeds? 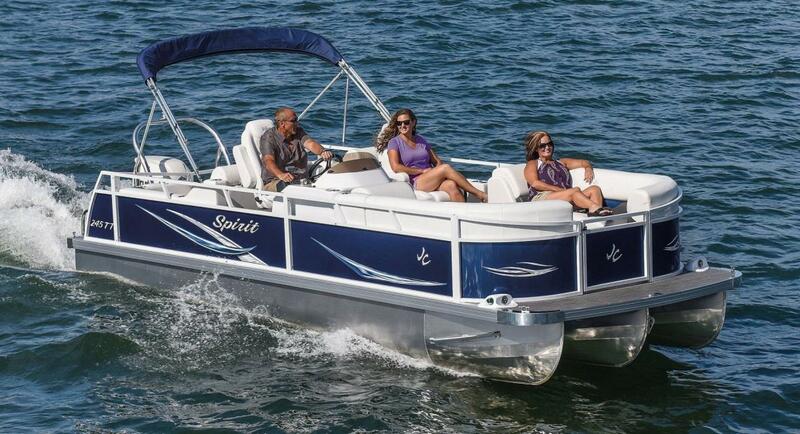 Then the Nautque Super Air 210 is the boat for you. You grab your board and head for the platform; your heart starts pounding like a jack hammer. You need 343 sizzling horsepower, long firm wakes with a clean lip and no trough. 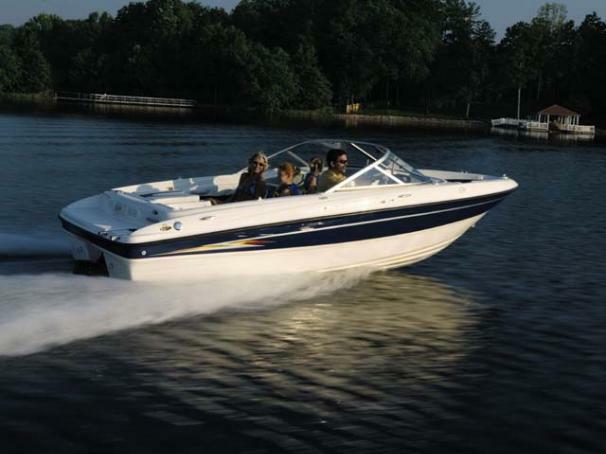 Semper Speed and Marine the Valley's largest selection of new and used boats! We have the best name brands...MasterCraft, Malibu, Sanger Boats, MB Sport, Natique, Tige, Axis, Eliminator, Nordic Power Boats, Monterey Sport Boats, JC Pontoons, Smoker Craft Fishing Boats, Starweld Fishing Boats, Premier Pontoons, Sylvan Pontoons, Alumacraft Fishing Boats, Cobalt, South Bay, Moomba, Calabria, Ski Supreme, Tracker Marine, Fountain Boats, Larson and more. 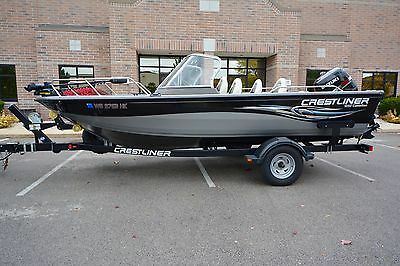 2008 CrestLiner 1850 Canadian w/ 115 hp 4-STROKE Suzuki. SUPER LOW HOURS! 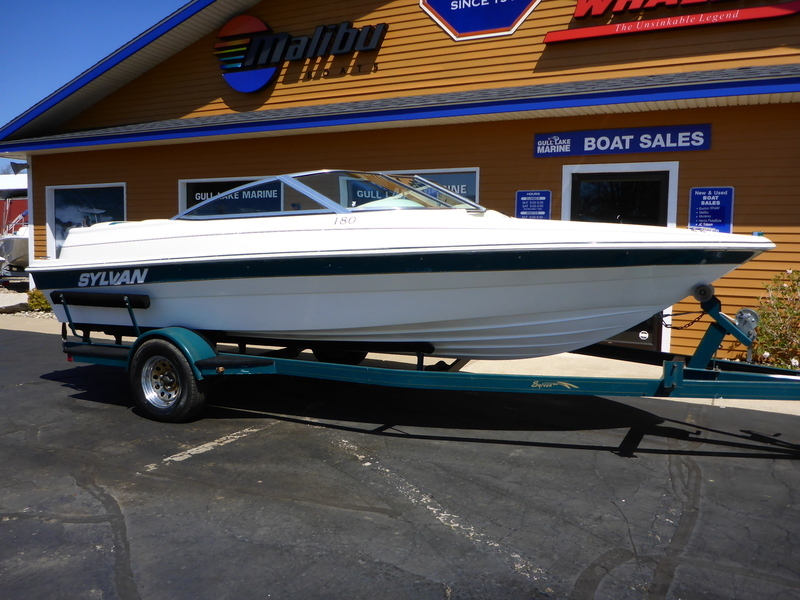 2006 Bayliner 185 2006 Bayliner 185 18'2" Local tradein! 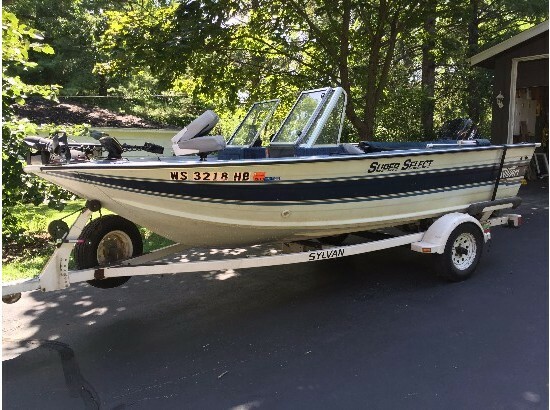 White and blue with tan snap in carpet, Ski storage, stereo, Humminbird 717 Fishing System graph, Built on rear ladder, tilt wheel, Super nice inside and out. 2 factory covers and bimini top. Always covered in garage. 4.3 Mercruiser. MPI fuel injected V6 I/O motor with 220hp. Starts and runs great!!!! Galavanized trailer with swing away tongue and brakes is included. Super nice outfit. Local tradein, garage kept. Extremely clean inside and out !!!!!!!!!!!!!!!! Length is 18'2" beam is 7'9" dry weight is 2120 lbs. and person capacity is 8. We accept TradeinsFinancing available.We specialize in Pontoon sales, trying to keep around 100 instock each Spring.We do sell new Bentley Pontoons, Sweetwater Pontoons, Aqua Patio Pontoons and Crestliner Pontoons, we also sell new Crestliner Aluminum boats and Hurricane Deck boats.We do try and keep a lot of used Pontoons instock including: Berkshire, Lowe, Suncruiser, Starcraft, Sunchaser, Sylvan, SunTracker, Tracker, Avalon, Harris, South Bay, Weeres, Bennington and Parti Kraft. Journey auto & Boats193 Automotive Dr. Richmond KY 40475 The Bayliner 185 has the largest 18-foot runabout interior in its class with the ability to configure the boat the way customers want it with multiple product configarations: 2 power choices, standard interior and seating, sport seating, and/or full fiberglass liner. 2003 TAHOE BOATS 204 WT LIKE-NEW Condition DECKBOAT I/O loaded with a custom Wakeboard Tower, Board Racks, Tower Speakers, Custom Tower Bimini, MerCruiser 5.OL Alpha MPI, ONLY 199 HOURS , EFI, Large Open Bow, Seating for 11 People, Digital Depth Finder, In-Dash Compass, Sink and Faucet, Ski Locker, Livewell, Sun Deck, Ice-Chest Storage, Matching Tandem-Axle Trailer with Spare Tire. GET ON THE LAKE TODAY AND WAKEBOARD, SKI, TUBE OR KNEEBOARD BEHIND THIS AWESOME DECKBOAT. THIS 2003 TAHOE IS IN EXCELLENT CONDITION WITH SUPER LOW HOURS AND IS PERFECT FOR ANY FAMILY. From either side, the view through these windows is looking good. The TAHOE 204 offers wind protection, power, performance and the convenience of a walk-thru runabout in a roomy deck boat that can accommodate your family and friends. You won't find a walk-thru sport boat with more luxury amenities. There's a plush L-shaped aft couch, spacious U-shaped seating in the bow, two big swim decks and a powerful AM/FM CD stereo. Other features include a sink with on-demand fresh water, a stowable carry-on cooler and generous storage throughout. All of this plus the awesome performance of our exclusive HydroStep strakes and PowerGlide hull, powered by a 5.0L MerCruiser engine. Visit semperspeedandmarine.com for more photos of this boat. Semper Speed and Marine is California's #1 boat dealer for new and used models from Sylvan Pontoons, Sanger Boats, Monterey Sport Boats, JC Pontoons, Eliminator Boats, Nordic Powerboats, Smoker Craft Fishing Boats, Premier Pontoons, Alumacraft, Cobalt, Mastercraft, South Bay, Malibu Boats, Natique, Tige, Axis, Moomba, MB Sport, Calabria, Ski Supreme, Tracker Marine, Fountain Boats, Larson and more. If we don't have it, we'll get it for you. Contact Us for more information regarding Financing Toll Free at 866-865-7619. Live outside our area? No Problem. We specialize in shipping boats all over the world, including AL-Alabama, AZ-Arizona, CA-California, CO-Colorado, FL-Florida, GA-Georgia, ID-Idaho, IN-Indiana, IA-Iowa, KS-Kansas, KY-Kentucky, LA-Louisiana, MI-Michigan, MN-Minnesota, MT-Montana, NV-Nevada, NM-New Mexico, OK-Oklahoma, OR-Oregon, TX-Texas, UT-Utah, WA-Washington, WI-Wisconsin, WY-Wyoming. *Price, if shown, does not include government fees, taxes, dealer freight/preparation, dealer document preparation charges or any finance charges (if applicable). Final actual sales price will vary depending on options or accessories selected. - LIKE NEW CONDITION, SPACIOUS DECKBOAT WITH LOW HOURS AND 5.0L EFI ENGINE!